I'm selling a few GX4000 / Plus PCB Boards. These boards are a perfect fit for existing shells fitting great. 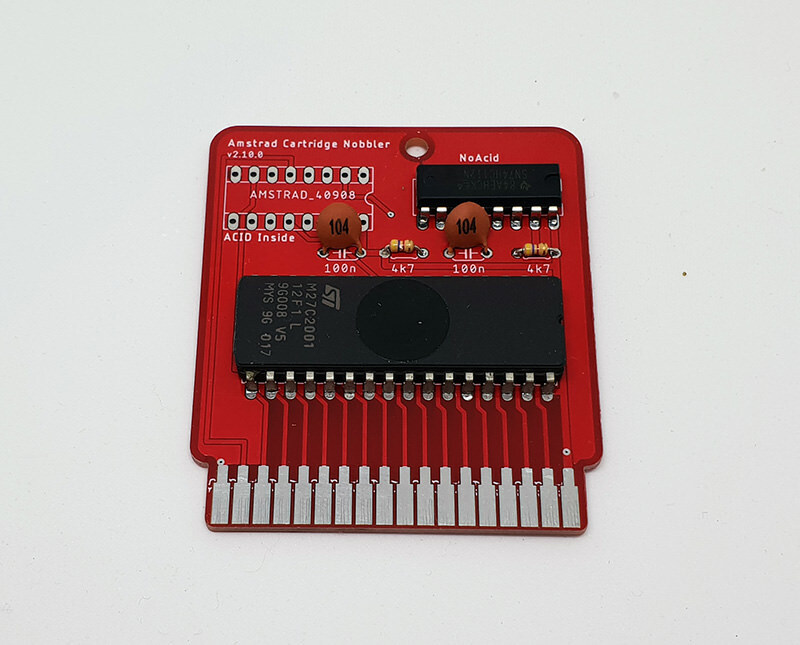 I have designed the board from scratch using http://www.cpcwiki.eu/index.php/Amstrad_Cartridge_Identification_Device as a schematic, and TheEqualizor's test cart as a pointer. I have 5 Red boards and 15 Green boards currently available. These boards are £2 each. 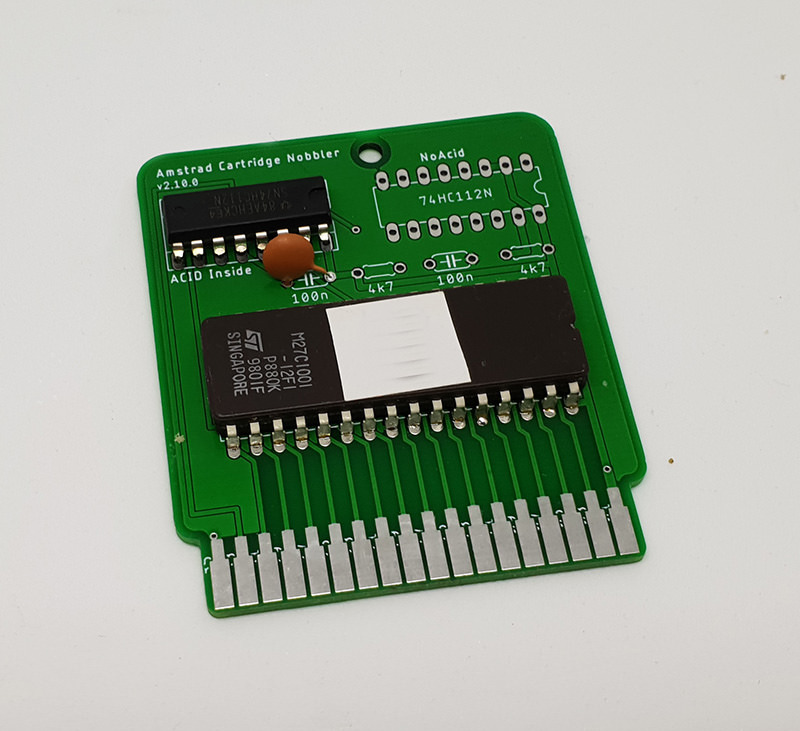 For this price, you will need to provide your own ACID chip, 100nf Cap and eeprom. The "Fun" bit about these boards is that they allow you to try the "no acid" trick. There are places to install a 74hc112n, and extra components required to run without an ACID chip. Your mileage may vary with this trick, but I've not seen a PLUS/GX that hasn't worked with yet, nor a software title. I would assume other variants will not work for simplicity, however I will add others when I get to test them. As a service, I will offer the following for cpcwiki. A board complete made up using the hack method with the game of your choice for £8 plus postage. I currently can only offer 10 of these. Please note, I am NOT charging for the software, just parts and my time. PM me what you're after. The game must be in CPR or BIN format, it will be best if you email me the exact game you want. However, If you wait a while, I am expecting some pcbs from another pcb manufacturer. 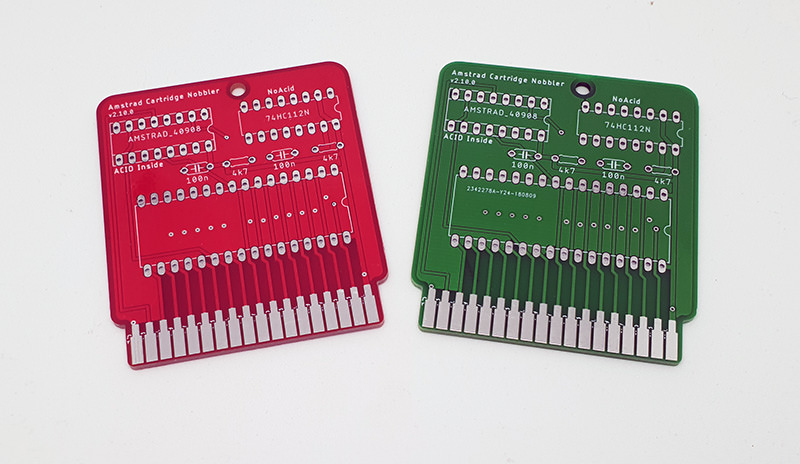 When these arrive, and if I am happy, I will release the Gerbers and details on how you can get your own pcbs. Nice boards. How reliable is the 74HC112 solution? Does it work on every start? Thanks Bryce, that means a lot from you. I have "Tested" every official available cart release and quite a few unofficial software release and have never had a start up issue... It has booted 100% of the time on both my gx4k and pimped 464+. I've heard reports of it being fine by many others, including 6128+ users. I've read there is a potential issue if you have a restart button on the expansion port, but I currently haven't tested this scenario. The target is really a gx4000 which doesn't eally get hard reset. I am interested in 1 red and 1 green, thanks. All red boards are now reserved. 10 green remain. All items posted out today. Funny thing is, that exactly today I received my own cartridge-design V1.1 wich also uses the (from me slightly modified) Octoate/Nilquader-Solution. Without modifying the 74HC112-Solution my 6128+ did only restart very few times after hardware-reset (like nilquader mentioned back then). Restarting with power-switch always worked.